From the first Slavic migrations to the Romanovs' rise to the Putin era, Russia has endured for centuries as a nation whose sheer size and diversity have challenged its rulers and shaped its identity. 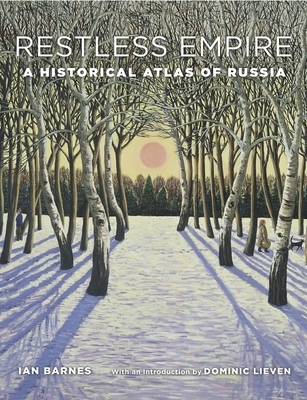 Restless Empire illuminates the epic sweep of Russian history in a beautifully illustrated full-color atlas depicting the essential cultural, political, economic, and military developments of Russia's past. Like the double-headed eagle that is its state emblem, Russia has always looked abroad to both the East and West, searching for secure trade routes, trustworthy allies, and defensible frontiers. Expansion beyond Muscovy's forested confines began in the fifteenth century, when Ivan III rejected Mongol rule and moved into the Russian steppe. The waterways linking the Baltic to the Black and Caspian seas were crucial to Russia's development from the Middle Ages onward. The age-old quest to acquire warm-water ports culminated in the construction of St. Petersburg in the eighteenth century, when imperial Russia began to rival Europe's Great Powers. From Ivan the Terrible to Catherine the Great, Lenin and Stalin to Yeltsin and Putin, Russia's rulers have carved their nation's destiny into world history, sometimes bending Russia toward despotism or democracy, internationalism or brusque independence. Russia's titanic conflicts--against the Tatars and Turks, Napoleon, Nazi Germany, and the United States--and its political upheavals from the Time of Troubles to the Soviet Union's downfall, as well as ongoing strife in Chechnya and Crimea, are presented chronologically in accessible text accompanied by detailed maps and illustrations.